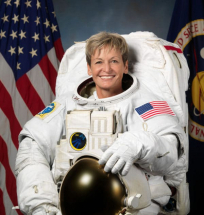 Why Book Dr. Peggy Whitson? First woman to command the International Space Station twice (2008 & 2013); first non-military Chief Astronaut and most spacewalks (10) of any female astronaut, the most spacewalks completed by a woman (at 60 hours, 21 minutes total) and third most of any spacefarer; and at 665 days, Dr. Whitson has spent more time in space than any other American. "I want to congratulate Peggy for her incredible accomplishments. She makes us all very proud. Exploration has always been at the core of who we are as Americans, and her brave contributions to spaceflight have continued that great tradition. Peggy is an inspiration to us all, especially to young women interested in or currently pursuing careers in science, technology, engineering and math."